Easter Weekend Sale: up to 30% extra discount on the New York Pass + 1 extra day Hop-on Hop-off bus! Click and order the New York Pass today here! 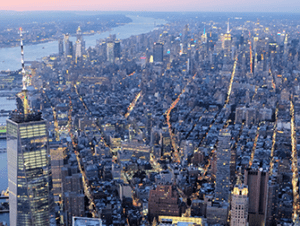 The evening helicopter tour and sightseeing cruise in New York is a spectacular experience. In the summer you will fly during the day and then cruise at sunset and twilight; in the winter both the flight and the cruise will be in the evening. Each has its own charm, but flying in the winter is especially unique because it’s the only option to fly in the evening. 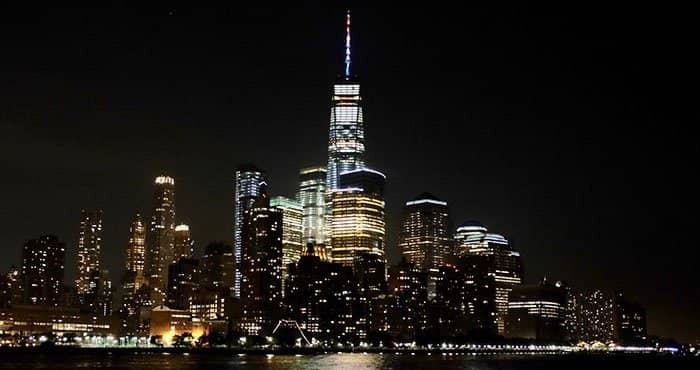 You will see the lights of Manhattan sparkle in the darkness from the water as well as from the sky. Spot attractions like the Brooklyn Bridge, Empire State Building, Central Park, Ellis Island, and many many more. The helicopter tour is the highlight of the evening. You will start your flight at Pier 6 (to get there take Subway R, 2, 3, 4, or 5) where your helicopter is waiting for a 15-minute flight around New York City. You will ascend at 17:30. This means if you prefer to fly in the evening, you should book the tour somewhere between October and March. During the other months it’ll be far from dark. 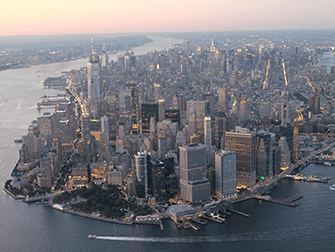 Your pilot is knowledgeable on New York, and will tell you more when you fly past landmarks like the Empire State Building, Chelsea Piers, Time Warner Center, 9/11 Memorial and One World Trade Center. In anticipation of the tour, you can see here which route the helicopter will take. It’s the one marked red. Once back on the ground, take a short walk to Pier 16 where you’ll board the cruise. If you take the cruise during the summer you’ll enjoy a beautiful sunset whilst cruising. During the winter months, it’ll already be dark when departing, which has its own charm: all the reflecting lights of the city that you previously seen sparkle from above. 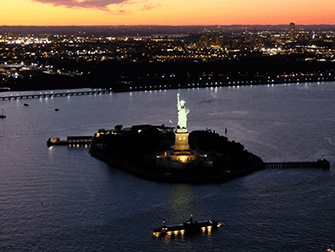 On the 45-60 minute sightseeing cruise the tour guide will tell you many informative, interesting and funny things about New York’s history as well as its iconic attractions. While the boat stops briefly under the Brooklyn Bridge, you will be able to admire a fantastic view of the skyline of Manhattan and take photos. To top it all off, you will have an up close view of the Statue of Liberty. 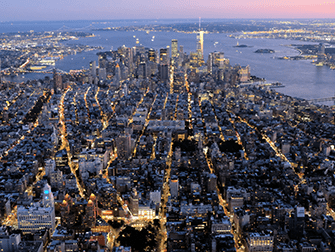 Eric’s Tip: This tour is very popular because it is the only tour with departure in Manhattan that flies in the evening! The tour sells out quickly due to the limited seating availability, so don’t wait too long to book. I would definitely recommend this, especially during the winter. In particular for those who have already taken a helicopter tour and want to experience something different. There are also a variety of helicopter tours that fly during the day. After purchasing you will receive a voucher that you can print and use as your ticket, or show as a mobile ticket on your phone. If you want to fly later in the evening or if the above flight is sold out, you can book an evening flight that leaves from New Jersey. You get here by train from Penn Station. 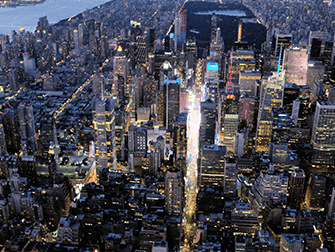 This flight takes 25-30 minutes, which gives you more than enough time to enjoy the breathtaking views of illuminated Manhattan. You’ll fly past the Statue of Liberty and One World Observatory and are able to see the Empire State Building and Madison Square Garden. You’ll also fly over Central Park and see the colourful lights of Times Square, before the helicopter will turn to return to New Jersey. This flight doesn’t include a cruise. See all the sights of New York by bus! A Broadway show is a must in New York! Safe, easy and cheap ways to travel!